Recently, Folgers asked me to write a post about my morning routine. So I thought it would be fun to share a little about how my mornings go. Let’s just start by saying, I’m an early bird. I like getting up early, and I really like getting up before my kids. My morning must-haves for a good morning are coffee, phone, computer and shower. I usually wake up around five, and the first thing I do is make my cup of coffee. 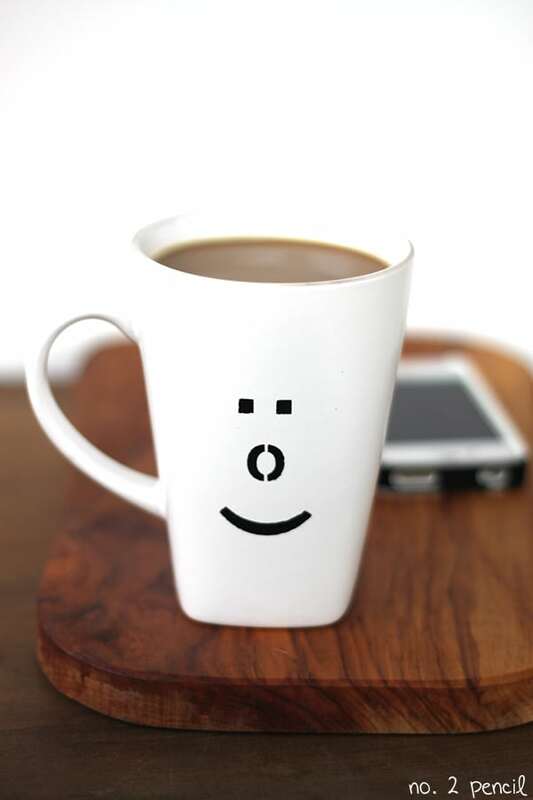 One of my favorite mugs is my emoticon mug I made a last year. It’s extra large, to hold plenty of coffee, and it makes me smile. Once I have my coffee in hand, the next thing I do is check my email and social media via my phone. I always start out on my phone, it’s kind of like my quick mini check in. Depending on my to-do list for the day, I’ll head into the office and work on writing blog posts. My mind is clearest in the mornings, so that’s the time of day I prefer to write. I don’t like sitting at the computer for hours on end, so I break up my work. I usually edit pictures at night, and write in the morning. I’ll work for an hour or so on the computer while the house is totally quiet, then I head to the shower and get completely ready for the day. Hair, clothes and make-up. I like to be dressed down to my shoes before the kids get up. I’ve truly found this to be my personal secret to having a good morning. When my son was a newborn, I found rather quickly that having a shower and being dressed for the day, before my husband left the house, made me a happier mama. I like being able to leave the house at a moments notice to run errands or go to the park. This has been my routine for the past seven years or so. Maybe it will change when my kids are older and more independent, but for now, I have found my secret to being a productive mom. Once the kids are awake, their routines kick in and it’s time for breakfast, lunch packing and getting them dressed. On the days when both kids are in school, I head back to the house and have another cup of coffee. I turn on my favorite internet radio station, sit at the computer and answer blog comments and emails. I also spend some time visiting other blogs. As a blogger it’s easy to get caught up in the work I need to do on my own site, so I am intentional about spending time on other sites. I love reading blogs, and I love supporting my blogger friends. When I am working on my own blog posts, I like to listen to a streaming radio station. For me, music and creativity go hand in hand. That is why I was thrilled to see Folgers supporting musical creativity with their famous Jingle Contest. You guys have to see the amazing talent that Folgers has tracked down across the country, and you can vote for the ones you think are best! Vote for the best Top 10 Finalist in Folgers’ Jingle Contest! Meet the Top 10! Take a look at Folgers® Jingle Contest Finalists, and listen to the tracks that earned them a spot in The Top 10. Cast your vote once every day through June 19th. You could win exciting prizes, like free Folgers Coffee, iTunes® gift cards, signed CDs from Gavin DeGraw, and even a $10,000 Grand Prize just for voting! Before you vote, follow the Road to the Jingle on Facebook to see how they traveled the U.S. to track down the Top 10 contestants! Remember, you can vote once a day through June 19th! Click here for official rules. I loved reading about your morning routine. I am glad to hear that someone else is a morning person. I don’t get up quite as early as you do, but I feel so much better when my day gets started on the right foot. You sound like a well organized person. When my day is chaotic or disorgnized I’m not near as content as I am when it goes well. Naturally, sometimes those days cannot be avoided, I just try not to allow it to continue in a downward spiral when they occur. Thanks for reminding us of “how to have a good morning” and an even better afternoon! I love this post! I should really, really become a morning person. Have you always been a morning person or did you have to adapt? If you had to adapt, how the heck did you do it?